The marriage of SARAH LOGAN to Thomas Fisher in 1772 united two of the most important and wealthy families in Philadelphia. As Quakers the Fishers did not approve of violence and theoretically did not take sides in the American Revolution but their sympathies were clearly with the British. Sarah kept a diary that contains her observations on the Revolution and is an important source of information about life in Philadelphia under the control of Pennsylvania officials anticipating a British attack and later during the British occupation. Sarah’s father had recently died and she makes mention of him. She called her husband “Tommy”. They somehow received news of what was going on by word of mouth, by messengers, or by newspapers, such as they were. November 30, 1776— …. men by order of the Committee of Safety* came for blankets; they took two by force…. * The Committee of Safety was established by the Pennsylvania Assembly in June 1775 and entrusted with the defense of the state. December 2, 1776— Heard in the morning that [British General William] Howe’s army were on this side of Brunswick. The town in very great confusion. A party of armed men went about the city to shut up the shops & break up the schools, by an order of the Committee of Safety. Dined alone. In the afternoon a company of men came to take Tommy’s name down, & to look at our servant boy Jim, with the intention if he was big enough to take him by force for a soldier, but as he was under 15 they left him, tho’ they took several others not much older…. December 3, 1776— …. Many people moving out of town, but we are as yet preserved in stillness….Dined alone….Sup’d alone. December 8, 1776— Morning at Meeting….After Meeting heard there was an express come to town last night with an account that Howe’s army were within 3 miles of Princeton & on his march….Stepped over in the afternoon to see Neighbor Evans who was in great distress for fear they should force her sons to the camp…. December 12, 1776— Busy in the morning mending clothes. 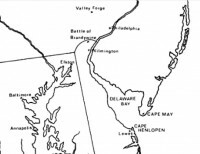 Heard that 2 men-of-war were in the bay & that several vessels were seen off the Capes …. In the afternoon an edict came out signed by General Putnam*, warning all the inhabitants to be in their houses at 10 o’clock, at the peril of their being sent to jail, & that no physicians are to go out without a pass from Headquarters … which edict greatly alarmed the inhabitants…. * American General Israel Putnam of Massachusetts was the military governor Philadelphia. He ordered what was virtually a state of martial law. December 13, 1776— …. General Putnam issued a proclamation declaring that any person that set fire to the city should be capitally punished. The evening before a bellman had gone through the city, ordering every person to go this day and assist in entrenching the city. If they did not, their effects were to be seized, but there were few people [who] obeyed the summons. I did not hear of one person going that I knew. Drank tea with my Tommy, who to me is always the best of company…. December 19, 1776— Morning at home at work ….met with John Foulke, who told us that the disorder among the poor sick soldiers was better, that not above 3 or 4 died of a day, but that there had died 10 of a day, & that the smallpox was broken out among them, which he expected would make a great destruction, as not above one in 50 of the Maryland soldiers had had it, many of them not having a bed to lie on or a blanket to cover them …. December 21, 1776— Morning at home at work …. Heard this day that Howe’s army were in many parts of the Jersies, plundered those that they looked upon as rebels, but were civil & kind to them that were friends to the government, & paid for what they took from them. December 22, 1776— Morning at Meeting. An Epistle read from the Meeting of Sufferings, entreating Friends not to join in the present measure…. December 25, 1776— …. Morning at Monthly Meeting …. An extract from my dear father’s will was read, wherein he bequeathed £50 to the Women’s Meeting to be given to poor widows, a laudable example & worthy of imitation …. December 27, 1776— This morning heard an account of the success of our American army against the English at Trenton on Christmas night, which was a very stormy night. 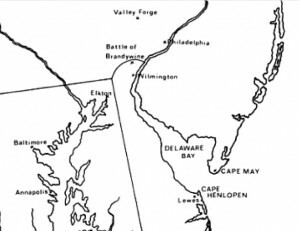 Report says that General Washington crossed the river before day at the head of a large body of his army & surprised the Hessians & English before day, that there was not a sufficient number there to oppose them, & that they surrendered themselves prisoners to General Washington except what betook themselves to flight, with he took about 700 prisoners & some cannon with a thousand stand of arms. This piece of news greatly exalted our Whigs, & as much depressed the Tories, but I sincerely hope & believe that before long General Howe will subdue their rebellious spirit & give them but little reason to rejoice…. December 29, 1776— …. Dr. Bond* called here after Meeting & gave us a very melancholy account of the sick soldiers, & says they have the true camp fever which is near akin to the plague. He says 15 or 20 frequently die of a day, that they bury 8 or 10 in a grave, & not above a foot underground. He thinks the disorder will spread & that the inhabitants are in great danger…. * Dr. Thomas Bond was a distinguished Philadelphia physician who supported the patriot cause and volunteered his services. December 30, 1776— Morning set off to go see Grandmother … but was interrupted by the way, & turned back by a multitude of people going to see the Hessian prisoners march to the barracks. Some people think about 700 marched, with some women & children. They looked but poorly clad, were dressed in blue, & their outside clothes appeared to be dirty. What is remarkable, they say there is not among them one English or Scotch prisoner, but all Hessians. This morning my Tommy conversed with the man who has the care of burying the sick soldiers. He says it is not true that the graves are so shallow, but that they die so fast that he cannot dig graves for them all, & so digs a large hole 15 feet square & 10 feet deep for them all, & so buries them two tier, & that the highest coffin is about five feet underground…. January 1, 1777— …. After supper my Tommy read me a paper called the American Crisis [by Thomas Paine], a most violent, seditious, treasonable paper, [written] purposely to inflame the minds of the people & spirit them on to rebellion, calling the King a sottish, stupid, stubborn, worthless, brutish man. Heard today that our army are going in great numbers towards Princeton, intending to make an entire conquest of the English, if they can. January 4, 1777— …. This evening a paper came out from the Committee of Safety unlike anything I ever before heard of, except the Spanish Inquisition, declaring that every person who refused the Continental money should be liable for the first offense to forfeit the goods & a sum of equal value, for the second offense to forfeit the same & to be banished what they are pleased to call this state, to what place & in what manner they shall judge most proper, that all those who have been imprisoned & whose stores have been shut up by them on the account of their refusing it formerly are to be opened, & they are to be subject to this new law, after having experienced all the rigors of the old one—a most extraordinary instance of arbitrary power & of the liberty we shall enjoy should their government ever be established, a tyrannical government it will prove from weak & wicked men. January 8, 1777— …. Morning went to meeting, which was silent. In the afternoon went to see Sally Allen at William Allen’s, where she had come a few days before, being turned out of her house by our troops because her husband had gone over to General Howe. January 9, 1777— Morning at home viewing the eclipse of the sun…. More from SARAH LOGAN FISHER in the next post. Wainwright, Nicholas B., and Sarah Logan Fisher. “”A Diary of Trifling Occurrences”: Philadelphia, 1776-1778.” The Pennsylvania Magazine of History and Biography 82, no. 4 (1958): 414-21. http://www.jstor.org/stable/20089127. 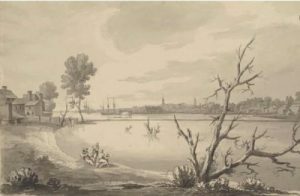 Illustrations: A view of Philadelphia in 1777 by the artist Archibald Robertson—The New York Public Library Digital Collections; The Crisis by Thomas Paine; Continental money 1777. After the Revolutionary War, John Jay was often away from his home while performing his duties as secretary for foreign affairs or as chief justice of the United States. But these absences from the family circle lasted only some months at a time, and John was still within reaching distance in case of an emergency. So the shock of SARAH LIVINGSTON JAY, upon hearing the news—not from her husband but from the newspaper—that President Washington was sending John Jay to England in 1794 to try to avert a possible war, is even now heart-wrenching. . . . . how my dr. Mr. Jay is it possible! The Utmost exertion I can make is to be silent. Excuse me if I have not philosophy or patriotism to do more. I heard of the nomination yesterday, so did the Children. The paper of to-day mentions it as a report that deserves credit. . . . Had any one predicted that dread wd. be mingled with my desire to see you could I have believed it? Never! Yet so it is. Should you leave us I must intreat you to permit your son [Peter Augustus] to accompany you. . . .
John Jay, asserting that he could not “desert my Duty for the sake of my Ease and Domestic concerns & comforts,” persuaded Sarah to change her mind, although only after he agreed to take their 18-year-old son with him. This time, the separation would last just over one year. 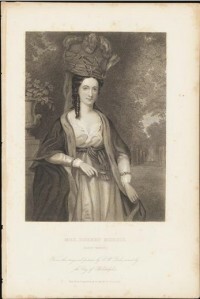 Sarah, as she had done before, oversaw the household and her children’s education, represented her husband entertaining public officials, monitored the building of the mills at the farm in Bedford, New York, and managed the family’s finances. She asked for advice when necessary, but carefully explained to John how she had handled investment matters herself. . . . . By this time I hope you have recd. my letters informing you that your Jamaica business is satisfactorily settled. The Money which I have received for you on that Debt, not being able to loan, I have embarked in the National Bank: the first sum of near 1000₤ procured 5 shares of 400 dollar each at 24 pr. Cent advance as I wrote you formerly, & I then intended awaiting your orders respecting the disposition of the rest; but finding it improbable that it could be placed to any advantage at all (a friend of yours having for a long time had 2000₤ to put out without having any applications for it) & the funds continuing to rise, I resolved last week to purchase 5 shares more at 29 pr. Cent advance; I shall however take care not to be so sanguine as to risque it after having by its rise cleared the interest the sum ought to make. Had I not been diffident of acting without yr. advice I shd. already have cleared 12 per. Cent. but I shd. not now have done what you when here, disapproved, had I not been of opinion that were you here at present, you would have altered your sentiments with the times. I shall however respect yr. sentiments more than my own, & will therefore probably sell out again in a month’s time, perhaps less. At the rate I’ve purchased for you it yields 6 pr. Cent, & even at fifty advance (which ‘tis thought it will soon be) better than 5 pr. Cent. . . . I sincerely hope that what I’ve done will receive yr. approbation, as my Conduct has not been the effect of a Gambling disposition, but the result of mature reflection aided by the Advice of those in whose judgement I had reason to confide. . . .
Papers of John Jay, at Columbia University. John Cleves Symmes’ land in Ohio called the Symmes Purchase was poorly surveyed and badly managed; portions were sold to settlers before Symmes and his associates had finalized the contract for them. Meanwhile Symmes went about building a home in North Bend, Ohio, during which time Susan Livingston Symmes and Symmes’ daughter Anna went to stay with her older sister Maria Short in Lexington, Kentucky. There Anna Tuthill Symmes met William Henry Harrison and fell in love. The couple married in 1795. Harrison went on to become President of the United States. SUSAN LIVINGSTON SYMMES became disappointed in her marriage rather quickly. Her husband did not consult her on their place of residence nor did he honor his promise to allow her to visit Morristown frequently. He also sought control of the money she brought to the marriage and decided that she could not “receive the interest or transfer the Stock” at her own discretion; she had wanted to use her money to repay her sister Kitty Livingston Ridley for debts incurred before her marriage. Susan contacted an attorney for assistance but it turned out that the lawyer was a friend of her husband’s who violated client confidentiality by passing along information to her spouse. Here is the letter she wrote to Judge Robert Morris at New Brunswick. He asserts that I transferred the 2400 dol. [to Mrs. Ridley] at Phil[adelphia], when on my way thro’ to N.Y. with him, (which was some time in June or July)—The fact is they were transferred the preceeding Spring at Baltimore, the certificates being on the books at Annapolis, could not I believe have been transfered at Phil—This transaction I acquainted Mr. S. with, no person being privy to it, tho I had no objection to its being public, & at the same time shewed him my accounts which was within a very few days after our marriage—& told him that the certificates (on the books of Pennsylvania) which I then shewed him, were Mrs. R[‘s], that I must make them over to her before I left the Country. His displeasure was great, he insisting upon it that it was all a gift of mine [from Kitty]—There was no more occasion to inform Mr. S. before our union that I pd. Mrs. R. than that I had pd. my other Sisters & Brothers. . . .
Mr. S. saw the account with the list of the other property I had & yet says I gave Mrs. R. three forths of my property—It was my intention to settle with her whenever stock rose that I could sell to advantage, & either divide the profits (if any accrued) with her or pay her the sums I had received on her account with interest from the time of receiving them. The Spring I made over the 2400 dollars, certificates were selling at 16s & Mrs. R. took them at par, so that she should complain if any one—I never made a mystery of any thing, I always told the Judge that my fortune was inconsiderable, but that Mrs. R. & myself by living together could be comfortable & independent—when conversing about property so shortly after our marriage he told me he had been informed I had six thousand pounds, & was greatly disappointed to find that I had not the half—that was no fault of mine—Certain it is that I have never spent a shilling either of his money or what was mine, but I have been a prudent, industrious, obedient wife, accommodating myself entirely to his manners & way of life, which are very different from what I have been accustomed to before our marriage—The transition was great indeed! & unspeakable is my mortification to find Mrs. R[‘s]. opinion of the Judge better founded than mine—Mrs. R. is a woman of the strictest veracity; & most rigid honor, & would not lay claim to property which was not her right. . . . It seems strange that Susan had not settled the matter of her money with her husband before their marriage or arranged for a prenuptial agreement; without one, according to the practice of the time, all property—real estate, stocks, money—belonging to the wife would be controlled by the husband. It is interesting that Kitty Livingston did not have a high opinion of Symmes. Next time, the letter Susan had written earlier to John Cleves Symmes on this subject. American Women Writers to 1800. Contributors: Sharon M. Harris – editor, (New York: Oxford University Press,1996), 92-94. By the middle of April 1777, it became abundantly clear that the goal of the British was to capture Philadelphia. MARY WHITE MORRIS again writes to her mother about the situation. (See previous posts here, here, here and here.) The Continental Army was in dire straits. 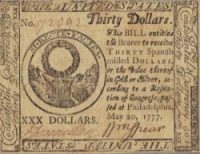 When several colonies did not contribute their share of assessed monies during the winter of 1776-77, Robert Morris loaned the government $10,000 to provision the desperate troops. And he underwrote the operations of privateers that ran British blockades in order to bring much needed supplies to this country, often to his loss, to which Mary refers in the following letter dated 14 April. There is orders from the Governor, to Innoculate all the Troops that are quarterd there [in New Town] Immediately. . . . There are now three men of War in our Bay, which look as if they intend this way; Mr. Morris has met with a great loss, as well as the Continent, by them, the ship Morris with a most Valuable Cargo of Arms, Ammunition, and dry goods. She had provided Her self with guns, to keep off any common Attack, but was most Unfortunately beset by three, the Roe buck one of them, at our Capes, She defended her Self bravely as long as it was possible, and then the Captain run her on Shore, and very bravely blew her up, and poor fellow, perished HimSelf, in his Anxiety to do it Effectively. We are prepareing for another flight in packing up our furniture, and Removeing them to a new purchase Mr. Morris has made 10 miles from Lancaster, no Other than the famous House that belongd to Stedman and Steagle at the Iron Works, where you know I Spent 6 Weeks, so am perfectly well acquainted with the goodness of the House and Situation. The Reason Mr. Morris made this purchase, he looks upon the other not Secure if they come by water. I think Myself very luckly in haveing this Assylum, it being but 8 miles fine road from Lancaster where I expect Mr. Morris will be if he quits this, besides many of my freinds and Acquaintances. So I now Solicite the pleasure of your Company, at this ones [once] famous place. . . .
We now begin to be Alarmd for Our City, theres 8 Sail of Men of War, at our Capes, and its thought are only waiting for their Transports to make an attempt. . . . I hope youll let me know if there is any thing in your House, you wish me to pack up and take care of for you. . . . This Alarm is not like the first, every body as yet, seems quite Composed. The letter can be found on pages 106-07 of In the Words of Women. 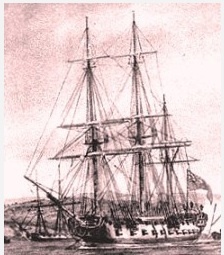 The Roebuck, pictured above, was a 44-gun British frigate. More information about the ship and its movements during the Revolution can be found on this WEBSITE. MARY WHITE MORRIS (1749-1827) was the daughter of Thomas White, a lawyer and surveyor, and Esther Hewlings Newman White. Her brother, William White, became the bishop of the American Episcopal Church. In 1769, Mary married Robert Morris (1734-1806), the Philadelphia merchant and financier, who almost single-handedly arranged the financing of the Revolutionary War, his own firm profiting handsomely in the process. With many others, in the winter of 1776, Mary had left the city in expectation of the arrival of British troops. She sought refuge with her stepsister Sophia Hall near Aberdeen, Maryland, her distress heightened by the medical needs of her son Thomas. Members of the Continental Congress moved their deliberations to Baltimore but left Robert Morris to oversee affairs in Philadelphia. At the time of this letter, the Morris children included Robert, Thomas, Esther “Hetty”, and William. Charles (b. 1777), Maria, and Henry would follow. I had not time by Joseph [a servant] to acknowledge the Receipt of your Letter by Mr. Hudson, we were at Suscohanah Ferry, I was Sorry the House was so crowded, tho with Delegates, he could not get Lodging, Else should have had more of His Company, He took an Oppertunity of telling me his House in Baltimore, was at our Service, my answer was, I should be Governd by You intirely, in my Future place off Aboad; I long to give You an Account, of the many Difficulties, and uneasyiness we have Experienced in this journey Indeed my Spirits, were very Unable to the task, after that greatest Conflict, Flying from Home, the Sufferings of our poor little Tom, distress’d us all, and without the Affectionate assistance of Mr. Hall, and the Skillfulness of Doctor Cole, whose Services I shall never forget, I don’t know what might have been the Consequence, as it was a boil of an uncommon Nature, and Required the Surgeons Hand; we had reason to Apprehend too, we should lose our goods, the many Circumstances, of this Affair, I must leave till I see you, as neither my Patience, nor Paper will hold out, Only that Mr. Hall. . . . Invited me to Lodge at His House, which when I declined, he politely Offerd me any Services in his power, and finding I had goods to be Carted Down he Immediately Offerd his Teems, which as soon as they arrived at the Bridge, were press’d for the Publick, but after all the Dangers, Ive the Pleasure to inform you, they are safely housed in this Hospitable Mansion. . . .
Joseph has returnd to Town for His Cloaths, I lent him our White Horse, he will wait on you for my nedles that are in a White nedle book in our tea table Draw[er] in the back Parlor, if they are not there Hero must apply to Anna for She must find them, Excuse me for troubleing you for what youll call trifling but indeed they are very necessary to me. . . . The letter is in the Robert Morris Collection: Henry E. Huntington Library, Lists No. 5, pages 53-55, transcribed by Louise North. [Microfilm, courtesy of Dr. Elizabeth Nuxoll]. The portrait is by Charles Willson Peale. Duer, Catherine Alexander "Lady "Kitty"
Click here to subscribe to In The Words Of Women via email. Copyright © 2019 In the Words of Women.